The new washing system was inaugurated by Engineer Salah Adbdul Rahman Amiri, who is the Assistant Director General for the services sector of the Dubai Municipality. Engineer Naji Al Radhi, the Head of Waste Management of the Hazardous Waste Division and Ramakant Dixit from MES LLC (Marathon Environmental Solutions LLC), who supplied the equipment, were also present at the event. The newly installed medical bin washing system will save time and resources, with only 850 litres of water required to wash 100 large medical waste bins. 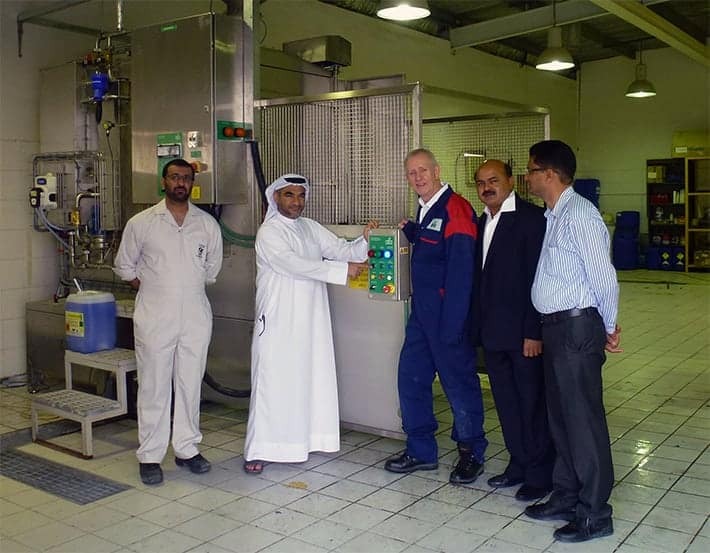 The Dubai Municipality Medical Waste facility will be able to save significant amounts of water and detergent thanks to the new system’s wash-water recirculation system, which incorporates a high-efficiency box filter that lifts out of the machine for easy cleaning. Manufactured from high-grade stainless steel, the ECW cabinet-type bin washer from IWM is robust and ensures thorough washing. A rotary jet nozzle system cleans bins internally, whilst external surfaces are washed using a powerful sustained jetting with bayonet type jets. The machine is easy to use and requires little operator input because of its semi-automatic design. The operator simply wheels the bins into the loading position, closes the safety gate and presses the load button. The washing and rinsing operations are automatic and, when they are complete, the operator only has to press the unload button to discharge the bins from the machine.